Coastguardsmen John R. Smith (1917 - ????) 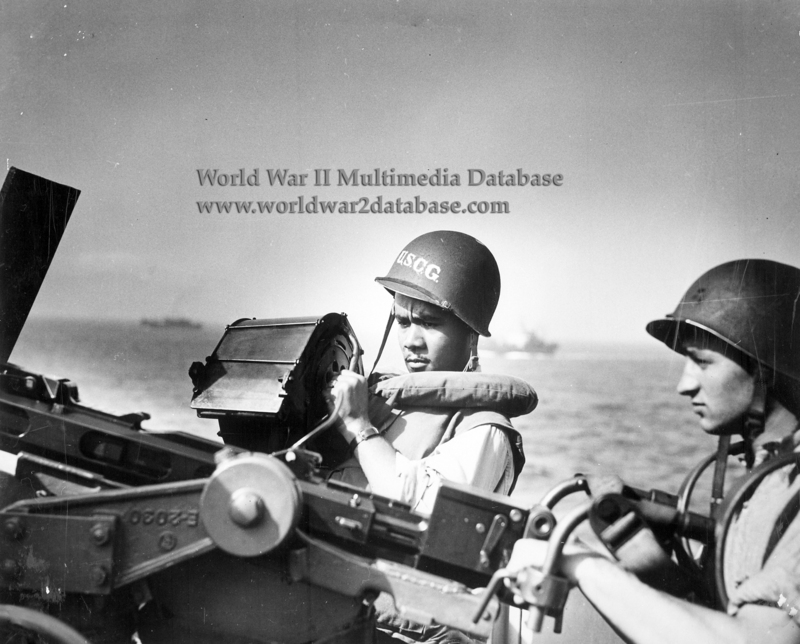 and Daniel J. Kaczorowski (June 1922 - ) operate a 20mm (.78 caliber) Oerlikon automatic cannon on a Coast Guard landing craft during the Invasion of Normandy. Four Coast Guard Landing Craft Infantry (LCIs) - LCI(L)-85, LCI(L)-91, LCI(L)-92 and LCI(L)-93 - were sunk in action of Omaha Beach on June 6, 1944. LCI(L)-85 landed at Easy Red Beach at 0830 Hours and immediately took heavy fire from German batteries ashore. She had numerous casualties — her Captain, Coast Guard Lieutenant Junior Grade Coit Hendley, estimated fifteen dead and thirty wounded. She came along USS Samuel Chase (APA-26) to unload her casualties with a severe list and soon sank. LCI(L)-91 hit a mine on her second beaching on Dog White Beach around 0800 and burned. LCI(L)-92 successfully navigated three rows of mined obstacles on Dog White at 0730 but as her crew thought they had cleared all mines, she struck a mine and then immediately came under heavy shellfire. The Army infantry successfully unloaded as the crew attempted to fight fires. She was abandoned on the beach at 1400 Hours without loss to her crew. LCI(L)-93 was holed at least ten times by shells and mines. Some of her wounds were more than a yard (a meter) wide. She sank off the beach in shallow water. Several of her crew were wounded. These were the only Coast Guard-manned LCIs lost during World War II.